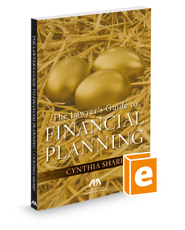 Published by the American Bar Association (ABA), The Lawyer's Guide to Financial Planning is intended to serve as a resource for attorneys committed to building and maintaining a strong and secure financial future. Familiarity with the material will also prove useful when friends, family members, and clients face some of the challenges discussed throughout. Each of us is able to exert control over our personal financial futures so long as we are armed with the requisite knowledge and wisdom. In this book, author Cynthia Sharp reminds you that your economy is not the global economy. A wealth gap exists among attorneys who have had similar opportunities. Obviously, professional choices dictate income potential. Yet there are those who have made lots of money while accumulating meager assets and there are those who have earned significantly less but are well on their way to retirement. Part One of this book sets forth a six-step approach to financial planning, emphasizing the importance of risk management. Comprehensive information applicable to planning for three financial life stages (funding education, retirement, and long-term care) is provided in Part Two. Part Three provides asset conservation strategies while Part Four focuses on effective distribution considerations, highlighting pitfalls to avoid in the estate-planning arena. Finally, Part Five provides a road map to the process of establishing long-term financial security.